Whenever you roast or grill a whole turkey, whether as the main event for Thanksgiving or as a family meal with lots of leftovers any time of the year, you can use just about every part of the bird. This expands the dishes or ingredients you get from the turkey while extending the value of your purchase. Once you’ve taken the meat from the bird, save the carcass and the giblets to turn them into an awesome broth with this turkey bone broth recipe. The compounds glycosaminoglycans in the bone broth promote healing of body tissue, while the broth can also benefit your immune system and gastrointestinal tract. When you use some turkey meat for the broth, you’ll gain some of the meat’s nutrients, which include B vitamins and minerals such as potassium, iron, zinc, and phosphorus. The compounds, glycosaminoglycans, found in bone broth may help to support healing of body tissue, while potentially benefiting the immune system and gastrointestinal tract. If you use some turkey meat for the broth, may gain some of the meat’s nutrients, which include B vitamins and minerals such as potassium, iron, zinc, and phosphorus. 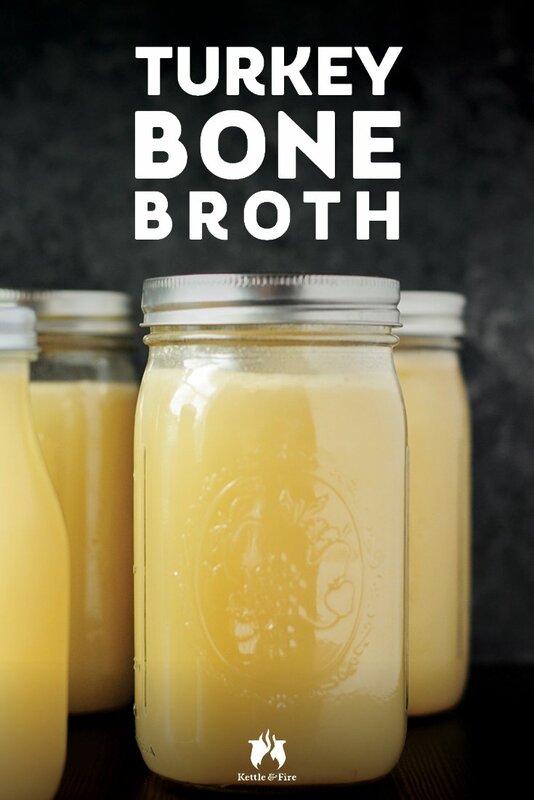 Once you’ve tried to make turkey bone broth at home, you’ll have the flexibility to customize your broth as you see fit, just like you can customize your turkey. We brined our bird in a salt, lemon zest, brown sugar, and herb dry brine. We found our broth very flavorful from the brine without adding extra salt, but you might want to salt the broth to taste if your roasted bird doesn’t have as much salt or as many seasonings. Nonetheless, keep in mind whether or not your broth has added salt when you cook with it later so you don’t end up oversalting a recipe. To add flavor to this turkey bone broth recipe, we used onion, garlic, bay leaves, and parsley, along with the out-of-the-ordinary addition of citrus peel. You could also experiment with adding sprigs of rosemary and thyme, carrots, and celery in addition to or instead of the ones we’ve used. In the end, a good broth is all about the fusion of flavors and the potential benefits you gain from slowly cooking it. 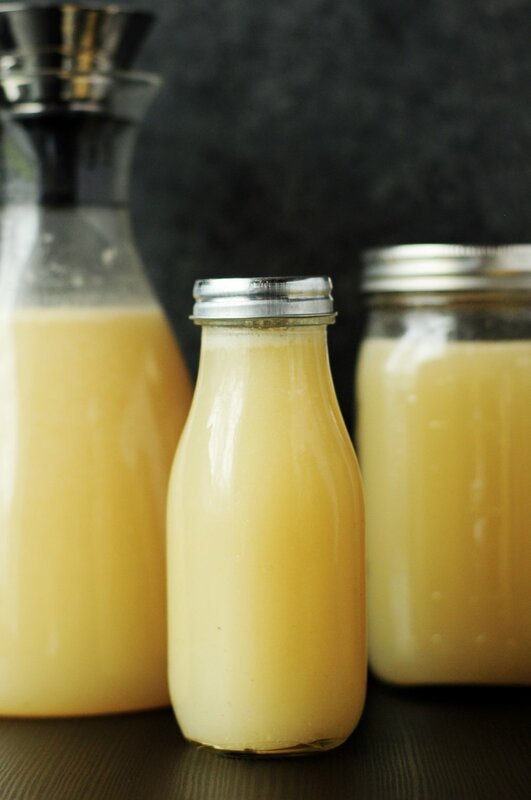 This is a savory turkey bone broth you can make from the carcass of a roasted turkey. Make it in advance and store it to use in meals, soups, and stews. Place the turkey carcass and giblets in a large stockpot. Add the onion, garlic, parsley, orange peel, and bay leaves, and cover with cold water. Bring to a boil and reduce the heat to medium-low. Simmer for 8-10 hours. Discard the solids and strain the broth through a fine-mesh strainer into a large container. Ladle the broth into mason jars. Once it’s cool, you’ll be able to remove the fat on the surface easily with a spoon. Enjoy and refrigerate or freeze the leftovers for later.